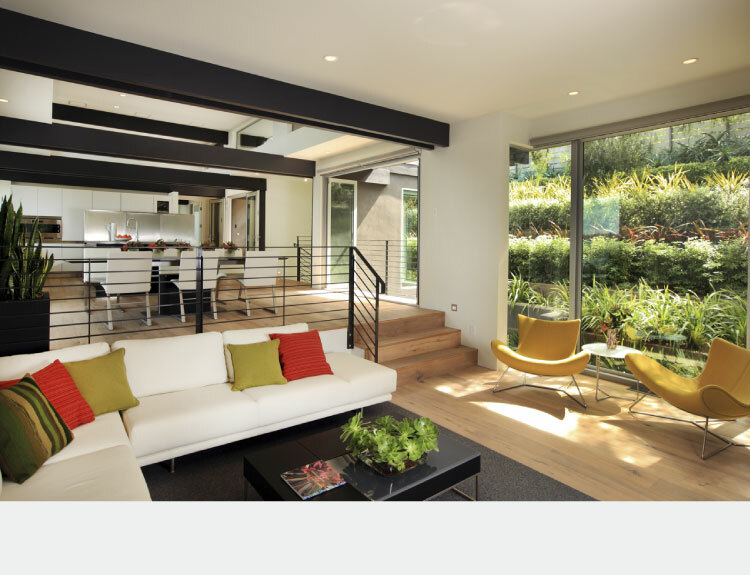 The home tour will last two days and is a self-guided romp through ten modern homes, including both new builds and 50s/60s renovations. Perfect for yours truly. Five homes on Saturday, November 10 and five more on Sunday, November 11. Dwell was kind of enough to share some pre-tour photos. Grab a cup of coffee (or tea for my Aussie blogger colleagues) and prepare to be stunned. The flat roofs, the steel windows, even the pavers and concrete. **sigh**. 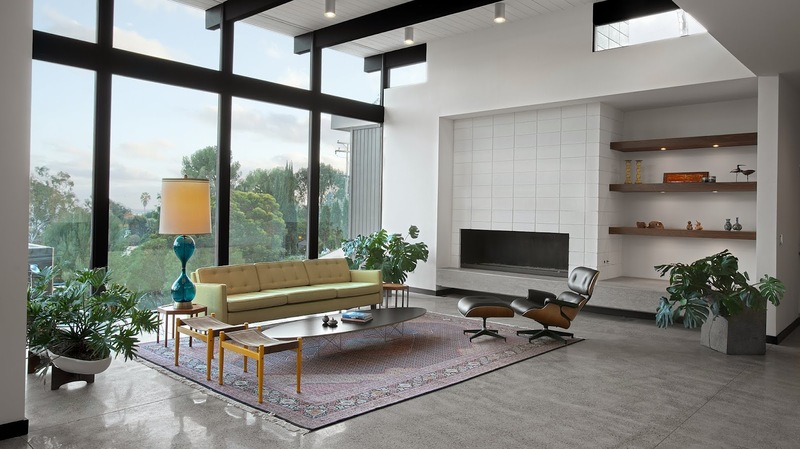 A wall of glass windows and wood floors is very mid-century. I spy Eames chairs and a classic mid-century mantle. This home is 1948 structure. The architects worked to preserve the character of the existing house while expanding and renovating it. 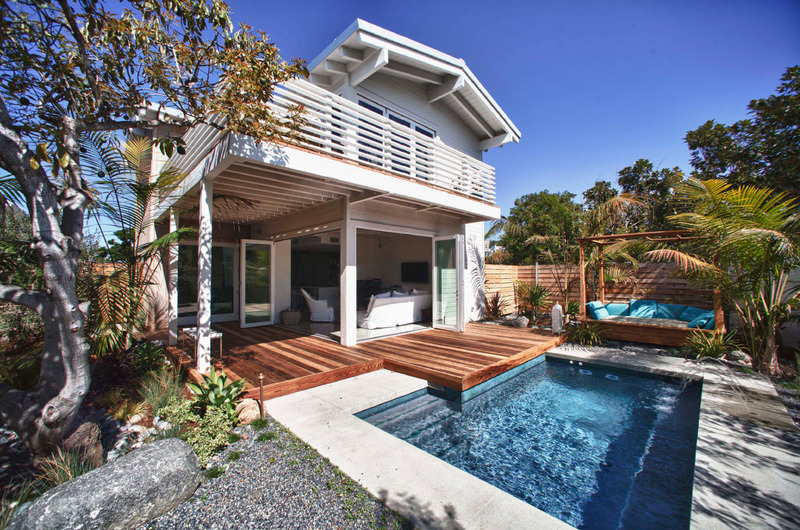 This home transitions indoors to outdoors seamlessly. 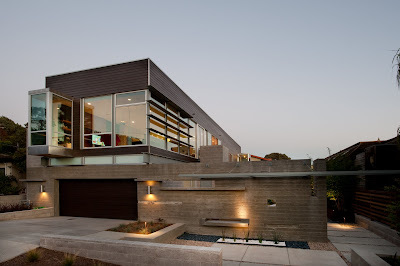 The architect and owners also paid close attention to the interaction of the home with the San Diego landscape. Incorporating this home into its surroundings was important to architect Bret Farrow. The design for the studio was influenced by Richard Neutra, Cliff May (noted San Diego modern architect) and William Wurster (another USC architect). One19 Living Studio. Photo by Brett Farrow. Sweet little pool. We would like a sweet little pool too but wonder if we would ever use it? This one looks like an oversize Jacuzzi which might be nice. Can't wait to see this house from the inside. 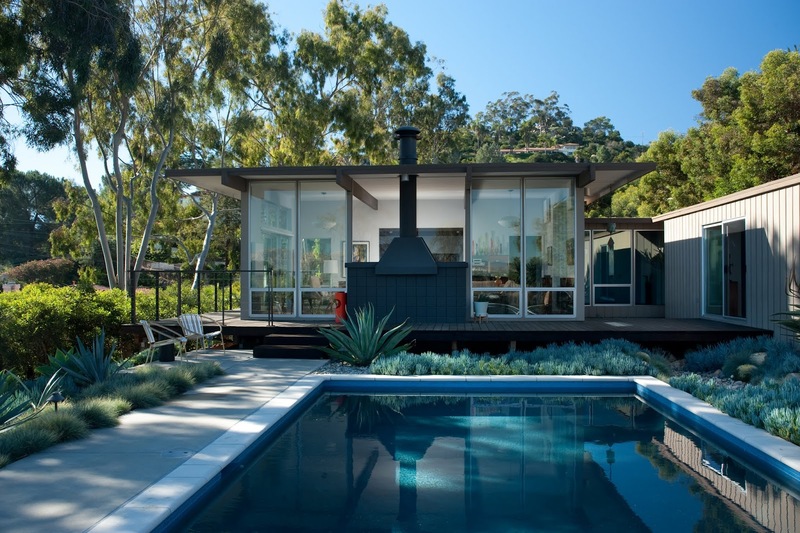 Cardiff has many homes on the coastline and this mid-century modern influenced darling was built to optimize the ocean view. 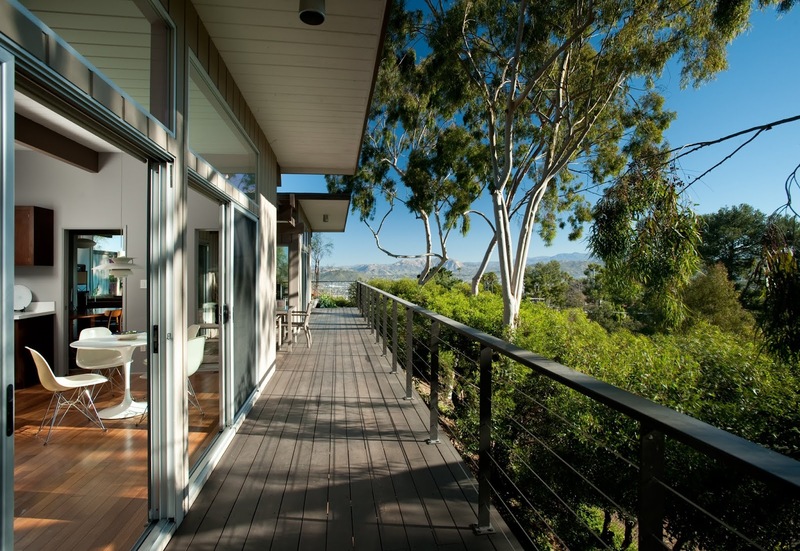 Each exterior wood panel is divided by a ribbon of steel framing an individual tree that was cut into planks--some span over 20 feet in a single run. I will be ever so curious to see this home. 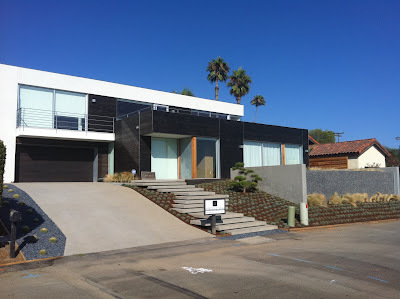 It reminds me a bit of the exterior of the John Lautner home on Balboa Island. Phoenix House, photo by Sebastian Mariscal. Lots of concrete. 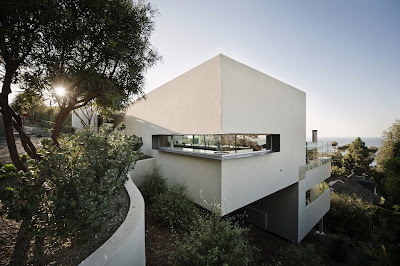 The architect in the write up speaks of an "emotional path of discovery" and "introspection." I am intrigued. The pictures don't reveal much, do they? And what do we have here? A house spilling down a hill, which is a common site in Southern California. 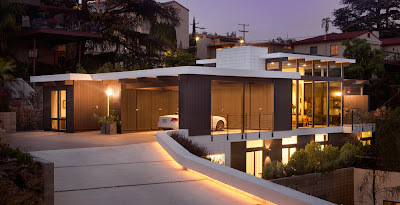 These precariously perched homes always make me a little nervous because of the earthquakes But, if homeowners can afford to build their modernist mansions on the side of a hill, then they can certainly afford to re-build them. So I don't worry anymore. Casa Diagonal. Photo by Dennis Viera. 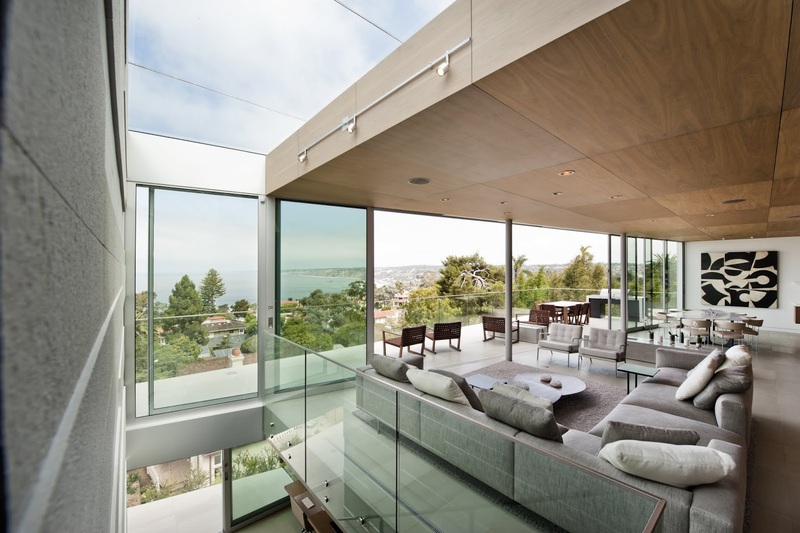 Those patios have ocean views for sure. One of the only reasons to build on the side of steep hill. 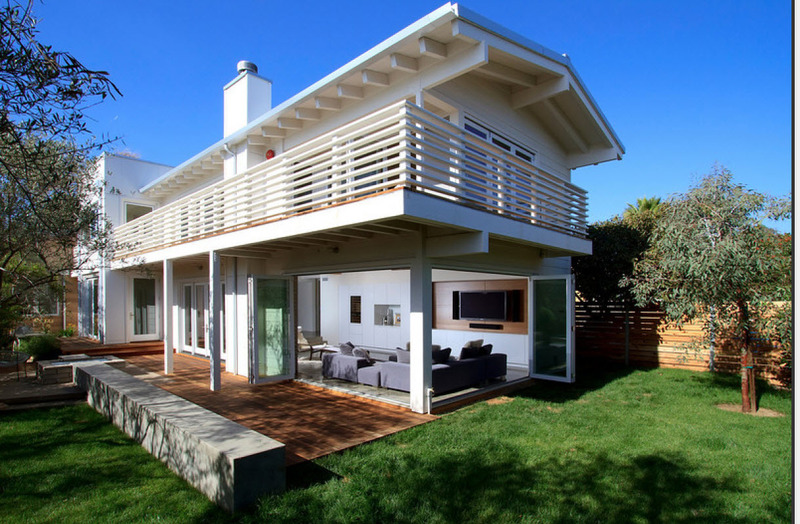 The "diagonal" comes comes from a wall that runs the length of the house diagonally and is a structural necessity. You can see it in the photo above. It probably retains the slope and supports the house. 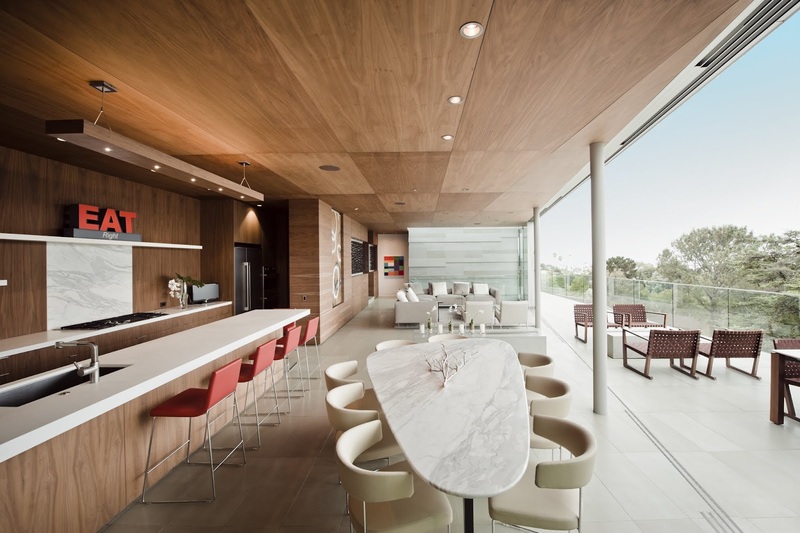 Clearly this home was built for entertaining. This room has seating for twenty-five and they aren't even trying hard. The levels open to each other, creating a corridor of space with balconies looking down, topped off by a glass ceiling. How's that for outdoors in? 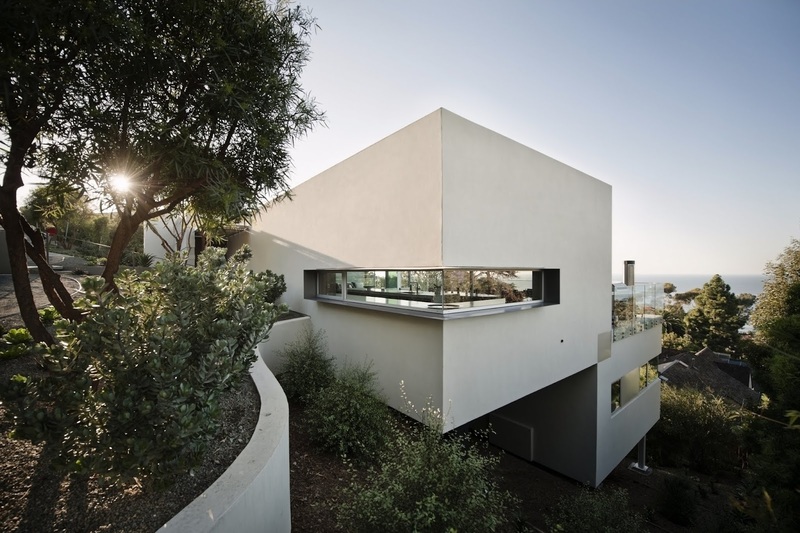 This is another home built on a dramatic slope. It was considered un-buildable, but the architect solved the puzzle with a curving driveway that acts like a bridge into the covered parking spot. How much more mid-century can you get (the covered parking spot, not the structural feat of engineering)? Eames armchair and other items that only Dana from Mid2Mod an identify. But they look extremely authentic. Fireplace with the niche shelves on the right is so mid-century. Shayan House. Photo by Reinaldo Solares. See the driveway curving from street side, into the house, basically bridging the street and the lot. Clever and expensive. The modular shelving under the window looks to be authentic Danish pole shelving. This kitchen has been kept simple. Only the stove gives its true function away. The angle of the picture makes the eating bar look like it is really close to the cabinets? This home is a 1964 John Mock (San Deigo 50s/60s architect) restoration. Expect mid-century all the way here. Yay! Perfect mid-century rectangular pool. Lots of windows bringing the outside in, even on the wall above the fireplace. Chavez Residence, photos by David Harrison. Awesome patio with views. A peak at a Saarinen table (like my mom had) and Eames chairs through the slider on the left. The original core structure of the Mission Hills Treehouse was telephone poles, as this is a canyon home constructed in 1978. The owners and the architect wanted to lighten up the house, opening up to views of their unusual terraced garden. Mission Hills Treehouse, photos by Shelley Metcalf. You get a good look at the structure holding the house on the hill, telephone poles and iron beams. You really can see the 70's influence as well. The patio in the rear is a an interior atrium patio (one side open to the hill). This home is new construction, but still just screams mid-century modern. Apparently, the architect rescued fixtures, appliances and materials from a landfill, originally from the penthouse of Henry H. Hester's 1959 Salomon Apartments ,and utilized the fixtures throughout the new structure. Luckies. This San Diego Dwell Home Tour promises to be magnificent. A portion of the Home Tour ticket proceeds will go to Dwell's non-profit partner, Architecture for Humanity. Look for photos in a few weeks. I promise to take more pictures of it on the tour! Oh, how to decide? 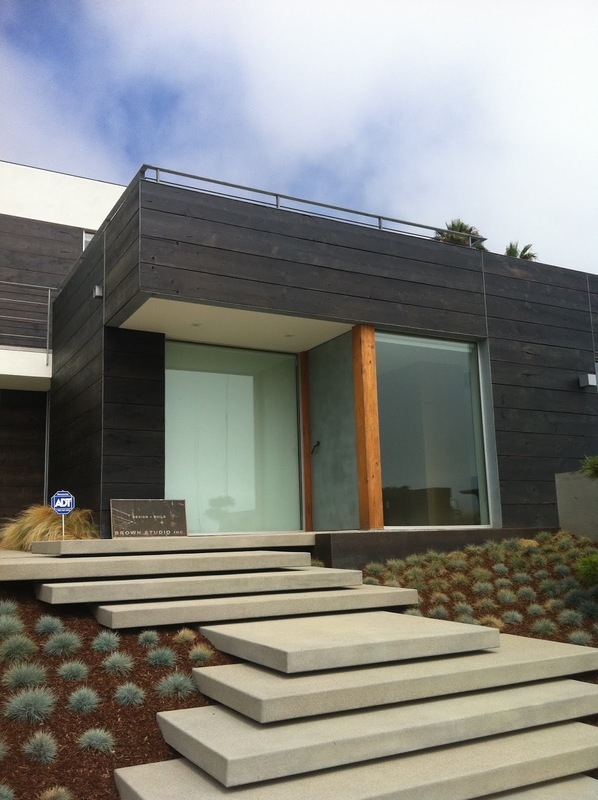 I love #2, #7 and #8...Harris, Shayan and Chavez houses. All of them are breathtaking, but those three are my favorites, I think. If I absolutely had to pick one, I guess I'd have to say #7. 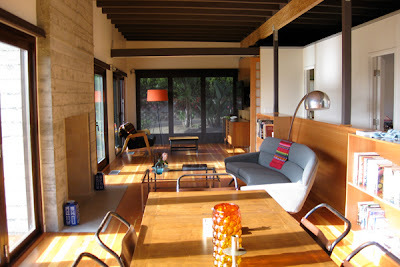 In that living room photo, I spy an Eames Elliptical coffee table, a Dunbar sofa and Artex side tables by Hans Andersen. I don't recognize the lamp as a Blenko style, but it might be...or it could be Italian. I've seen Empoli lamps that look very similar. The stools have me stumped. The have legs similar to Moller stools, but I've never seen a Moller with a sling seat. YAY Dana! I knew you would come through; you are the furniture expert in the mid-century modern world as far as I am concerned. I am curious about those stools as well and thought maybe you would know. I definitely think #7 is a really good choice. It is new construction and looks like they did a great job. It's a tie between #3 and #9. Ilike they way the overhang has been used to create a covered patio in #3. The siting of #9 looks spectacular with the house nestled in the trees. 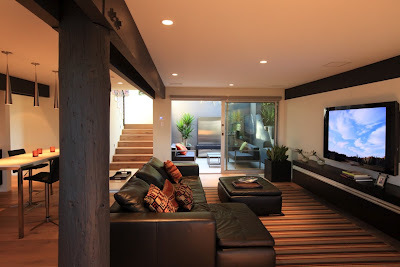 And I love the natural lighting of many of the interiors--really brings the outdoors in, and why not in So. California? #3 and #9 are also good choices Donna! I think #3 is charming as well. But #9 is so cool with those big telephone poles as well as the site being nestled among the trees. The owners/architect have fairly well purged #9 of the 70s but not quite, which is a-ok too. You are a lucky duck Rebecca! It would be my idea of heaven to potter about and explore those beautiful homes. My favourite is the Chavez residence, it looks like it could be here in Aus with those Eucalypts in the background. 70's tree house v. nice too, and as far as a new build goes I pick #1. Make sure you keep your promise Rebecca, I can't wait to see more! It is so hard to pick. 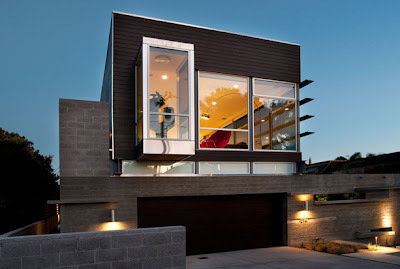 Agree that #1 for new construction would be very nice for sure -- I gravitate always towards concrete, steel and glass. What can I say. 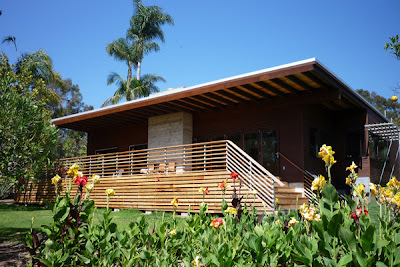 But the Chavez residence...#8, charming indeed. I will keep my promise! Promise! Hi Donna... yes on the FB page. What took me so long I don't know. I LOVED the Problogger event. I hate to go on but I really did. I was wondering if any of you ladies went in person. Ooooh nice weekend getaway idea.....this would be fun! Absolutely, you are too kind! As one who lived the mid-century modern era and then looking at what the media is trying to palm off as 'modern' & doctoring up mcm architecture into authentic 'mid-century modern' - I can tell you, BS!! 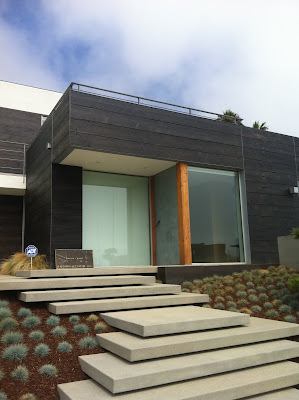 The media is trying to infuse the clean, modern buildings with plenty of rock walls & lumber.. BIG lumber. And, the elephant in the room IS big timber/lumber. They killed the post-WW2 thrust of America's emergence as a space-age modernist nation. No way they were going to allow architects to build the logical, intelligent & modern nation WE, the people craved. No Eichler type courtyard, atrium style houses and NO concrete, glass & steel modern dwellings for us. 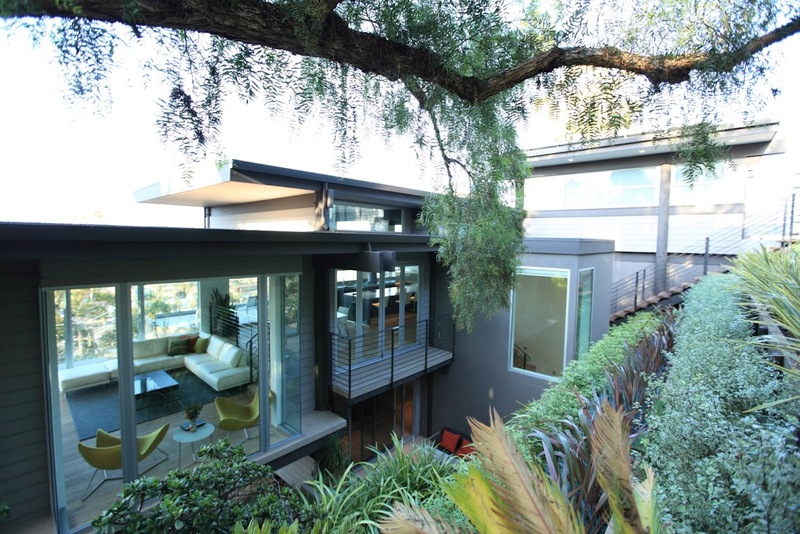 Like the Case Study houses. Particularly #21. The corporate syndicates that dictate how we live and they materials we use - are why we suddenly began going backward. No more like LAX type! They use the media to denigrate modern & build up old fashioned.